After the publication of Butcher's Moon in 1974, Donald Westlake said, “Richard Stark proved to me that he had a life of his own by simply disappearing. He was gone.” And readers waited.But nothing bad is truly gone forever, and Parker’s as bad as they come. According to Westlake, one day in 1997, “suddenly, he came back from the dead, with a chalky prison pallor”—and theAfter the publication of Butcher's Moon in 1974, Donald Westlake said, “Richard Stark proved to me that he had a life of his own by simply disappearing. He was gone.” And readers waited.But nothing bad is truly gone forever, and Parker’s as bad as they come. According to Westlake, one day in 1997, “suddenly, he came back from the dead, with a chalky prison pallor”—and the novels that followed showed that neither Parker nor Stark had lost a step. Backflash finds Parker checking out the scene on a Hudson River gambling boat. Parker’s no fan of either relaxation or risk, however, so you can be sure he’s playing with house money—and he’s willing to do anything to tilt the odds in his favor. 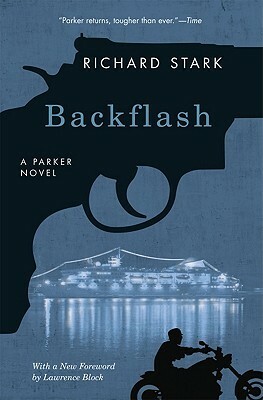 Featuring a great cast of heisters, a striking setting, and a new introduction by Westlake’s close friend and writing partner, Lawrence Block, this classic Parker adventure deserve a place of honor on any crime fan’s bookshelf.